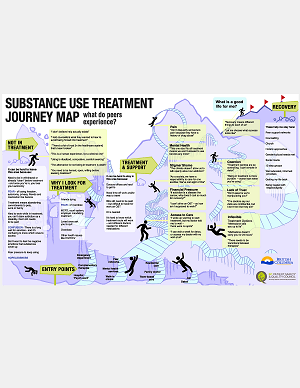 In the summer and fall of 2017, we partnered with the Ministry of Health, the Ministry of Mental Health and Addictions, the First Nations Health Authority and the General Practice Services Committee to host two journey mapping sessions to explore the current state of treatment options and support for people with substance use concerns in primary care settings – from both the health care provider and the patient/peer perspectives. Over 120 health care providers, patients and organizational representatives contributed to the creation of six distinct journey maps. A final report summarizing the results from both sessions and high-resolution versions of the final maps are available for download. 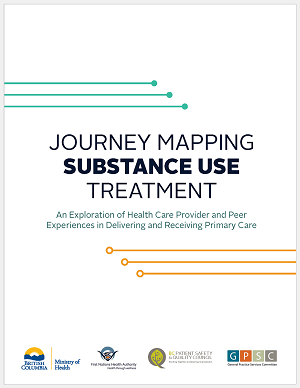 This report includes an executive summary, a description of the journey mapping process, an overview of the maps themselves, and a discussion of major themes and change ideas. Next steps are also included.